<br>Robert Luff & Co are delighted to offer to market this well presented older style end of terraced family home ideally situated in this favoured central location with local schools, shops, town centre and of course Worthing's mainline station all nearby. Accommodation offers entrance hall, living room with feature fireplace, separate dining room, modern kitchen, separate ground floor w/c and utility room. Upstairs over two floors are four good sized bedrooms, modern family bathroom and en-suite shower room. Other benefits include double glazing, gas fired central heating and south facing rear garden. Attractive double glazed bay window to front, continuation of the oak flooring, feature fire place with decorative pebble inset and electric fire, TV point, telephone point, coved ceiling. Double glazed window to rear overlooks the garden, slate effect tiled floor, single sink unit with drainer and mixer tap inset to oak effect roll top work surface, matching range of wall and base units, built in 'Stoves' oven with four ring hob and stainless steel extractor hood above, radiator, part tiled walls, double glazed door opens out onto the garden. Double glazed window to rear, low level flush w/c, wall mounted wash hand basin with tiled splash back. Stairs leading up to first floor landing. Double glazed window to front aspect, laminate flooring, radiator, TV point, built in under stair cupboard, coved ceiling. Double glazed window to rear, radiator with decorative cover, laminate flooring, built in under stair cupboard, coved and skimmed ceiling. Double glazed bay window to front laminate flooring, radiator, coved and skimmed ceiling. 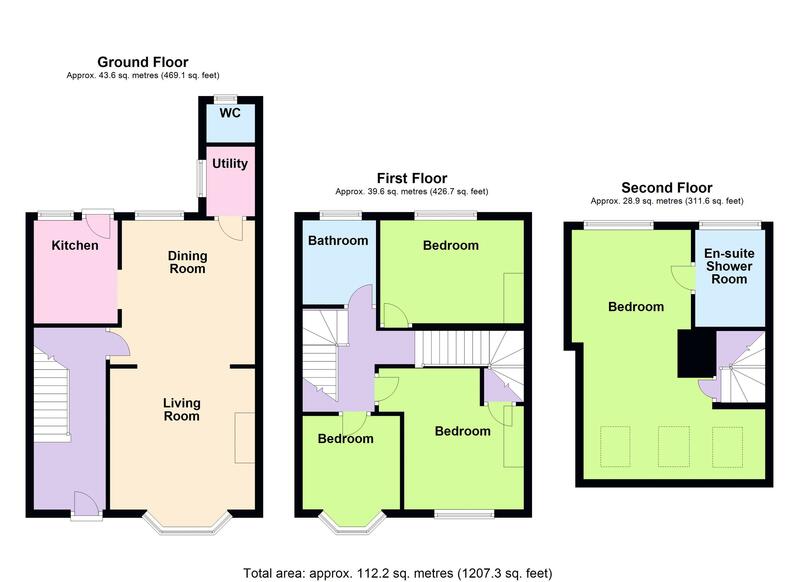 Double glazed frosted window to rear, tiled floor, tiled enclosed Jacuzzi bath with shower over and screen, pedestal wash hand basin with matching top, low level flush w/c, heated towel rail, cupboard enclosed boiler, fully tiled walls. Double glazed frosted window to rear, tiled floor, walk in glass enclosed shower with floating head and separate attachment, wash hand basin inset to vanity unit with storage below and chrome mixer tap, low level flush w/c, heated towel rail, extractor fan, skimmed ceiling with spotlights. South facing enjoys the sun all day long, mainly laid to patio, ideal for entertaining and low maintenance with a rope hanging border before stepping down to astro, the garden also benefits hard standing shed area and gated rear access.